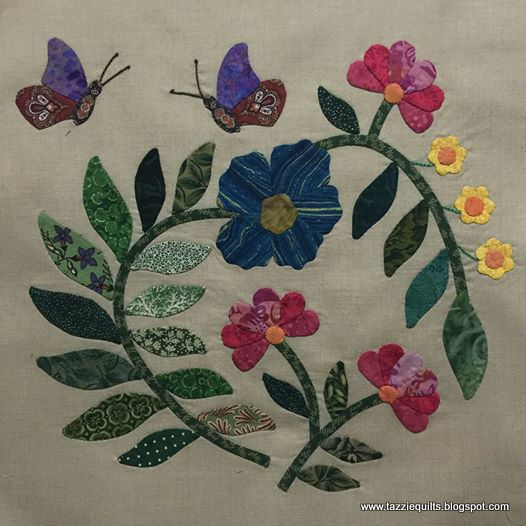 How fun to use a little of my William Morris fabric for the large flowers in this block - I have quite a lot of it, and I keep hoarding it for some future (as yet unknown) project. 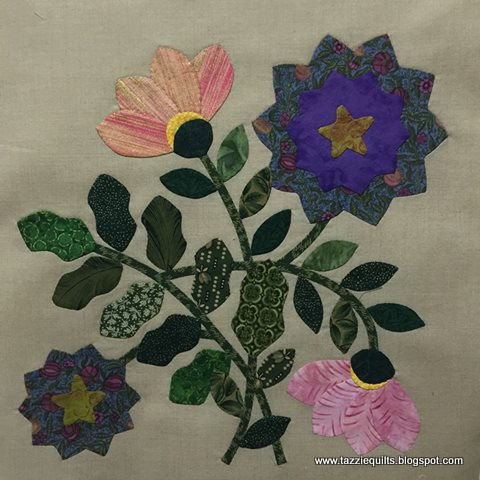 And I'm in love with the pink/peach/gold fabric, it really looks cute for petals. I think I only have 7 blocks left to stitch now, and the border too - I'm pretty sure I'm going to do the border differently to the original pattern, but let's see how I feel when I get there. Hope all my lovely family and friends are having a wonderful Easter break. Big love and hugs! Last night I finished another Caswell block - I don't mind confessing that I wasn't in love with this block while I was stitching on it, and I still don't think it's ever going to rank up there with my favourites! In the original block the stems are embroidered in place, but I don't really like embroidery (read: I'm not very good at it) so I decided to use bias strips instead. The bias strips make the block look a little more clunky, but I'm definitely not going to change it now. 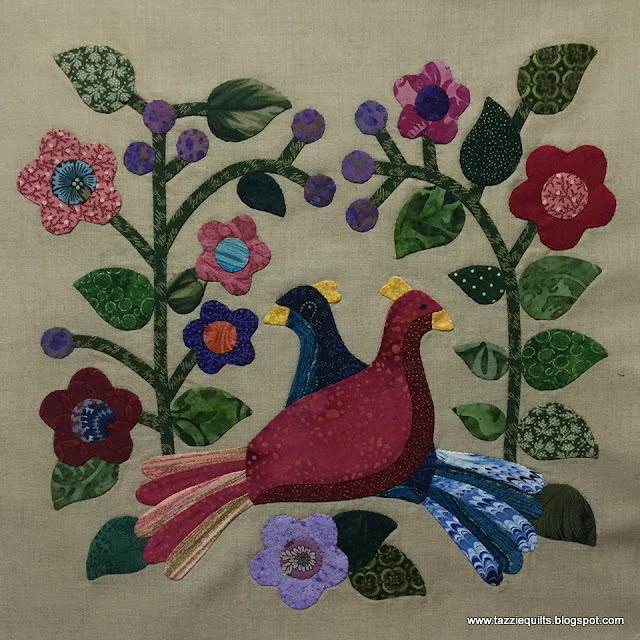 It probably would have been better to have the combs on the birds heads in a different fabric too - sometimes it's just so hard to decide on which ones to use. I'm so glad this block is done though, and I know it's going to look great with all the others. There are only eight to go now - happy days!! I genuinely have the most exciting news!! 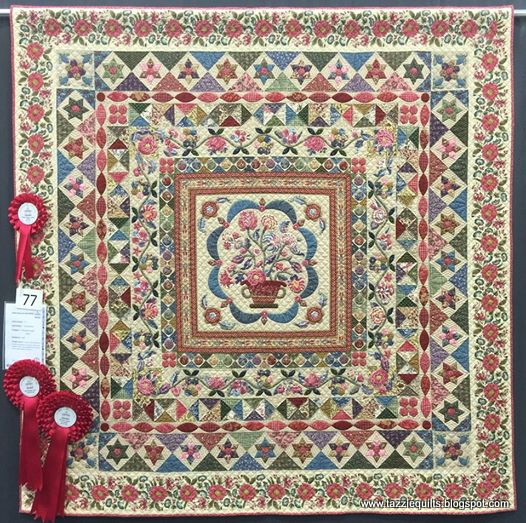 Last night I learned that my Montmellick Mastered quilt was selected to be part of a Quiltmania special exhibit next month at the Pour L'amour Du Fil quilt show in Nantes, France! It's impossible to express how exciting this news is to me, I feel so very honoured! At the moment I don't know how the logistics will work, and I'm not sure if I'll be able to get over there or not, but all these things will sort themselves out - and fairly quickly I'm sure. In the meantime, I get to enjoy the fact that my quilt has done me proud, and is soon to be very well travelled indeed! Happy days!!! 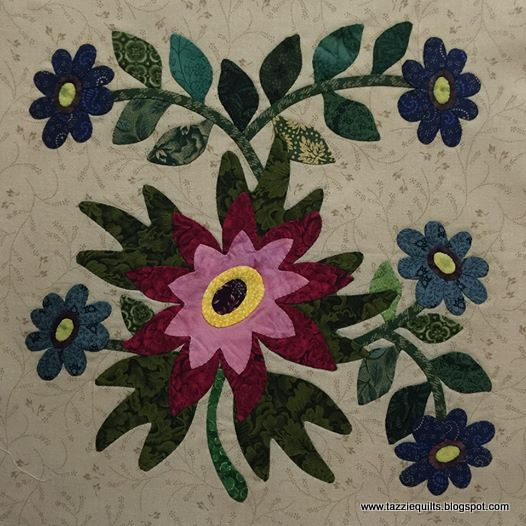 This was another fun block to stitch, and a big thank you to my sweet friend Norma for the scraps of blue fabric I used in the flower. The fabric will also look lovely in bird feathers etc, and I can't wait to use it again! Interestingly, this block is labelled D4 in the pattern, but in the picture on the cover, the block appears in Row E. It's not a big deal though, if I choose to do so, I can swap the blocks around when I begin constructing the rows, both blocks use the same background fabric and are interchangeable. Just a quickie post for this morning - I wanted to share that I finished block D3 a few minutes ago! These blocks are so addictive and I'm just loving stitching on them. Each time I use the glue baste technique, I thank Teresa from Fabric Therapy for sharing it with us, it really has made my stitching life so easy! 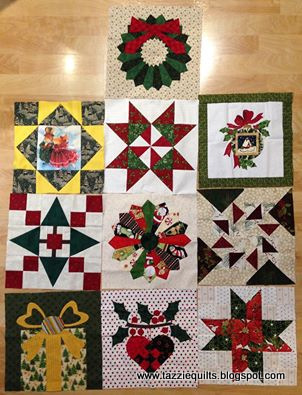 I had planned to work on the blocks in order, but I needed to get some hand work ready to take out, and I didn't have any bias strips prepared, so I jumped on the next block that didn't need any. I'll get back in order for the next block. This one was fun to put together, and I'm still having fun mixing up all the greens. I found a couple more in my 2.5" strip box when I was putting strips away so they've been added into the mix. A notable fabric is the one with the large feathery leaves on it, I think that's another super oldie - a gift from Linda in 2000! Aren't they cute? I still don't know what block is coming to me or who made it - it will be a lovely surprise when it gets here in the mail. How lucky I am to be a long distance member of the Quilt Batts.